By asking the right questions, school leaders can coach teachers to use technology to drive deeper learning. Recently, I asked a middle school principal how she assessed the technology choices made by the teachers in her building. She admitted, "I usually just tell teachers that I want to see them using iPads, but honestly, I am uncertain as to what I should be looking for when it comes to effective use of iPads for student learning." This administrator is not alone. 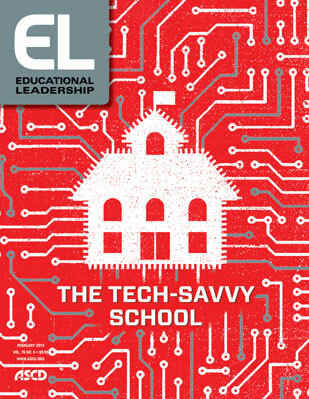 Many school leaders feel pressure to encourage teachers to integrate technology, often spearheading the purchase of expensive digital equipment and applications to keep up with other schools. Yet they do not have a strong conceptual framework for how technology should be integrated. Over the past decade, I have collaborated with school administrators on how to use research-informed strategies to coach teachers in using technology tools in ways that lead to academic and social-emotional growth. I've discovered that the secret ingredient to learning with technology is found not in the tools themselves (despite the wealth of marketing on the benefits of particular educational apps or devices), but in the instructional methods the teachers employ with the tools (Bebell & Kay, 2010; Kay & Lauricella, 2011). To capture this dynamic, I've developed The Triple E Framework, a free resource that administrators can use as a research-informed guide to support teachers in choosing technology tools that add value to learning goals. The three elements of the Triple E Framework—engagement, enhancement, and extension—should be considered when integrating technology into a learning activity. The framework also includes nine simple guiding questions (see Figure 1) that administrators can ask teachers when assessing a lesson plan that incorporates technology tools. Does the technology allow students to focus on the task of the assignment or activity with little potential distraction? Does the technology cause a shift in the behavior of the students, where they move from passive to active social learners? Does the technology tool aid students in developing or demonstrating a more sophisticated understanding of the content, creating opportunities for creation/production over consumption? Does the technology create paths for students to demonstrate their understanding of the learning goals in a way that they could not do with traditional tools? Does the technology allow students to build skills that they can use in their everyday lives? For more than a century, education experts have been clear that learning occurs through social interaction (Dewey, 1897). So educators should ensure that technology doesn't remove the social component to learning; it should instead include opportunities for students to engage in meaningful conversations and reflect with others on what they are working on (Hirsh-Pasek et al., 2015). Administrators can encourage teachers to look for educational apps and tools that allow students to engage with others. One basic example is Google Documents, which allows students to comment on, chat about, and synchronously edit each other's work. Consider a 4th grade teacher who would like to encourage students to add more detail in their writing. She could have her students write stories in Google Docs. Once a week, the teacher pairs each student with a parent or editing expert (such as a high school senior in AP English). The student and editor each log into the document at the same time, which allows the editor to talk about writing and give the student suggestions about adding more detail. This synchronicity also allows for the student's questions to be answered, and any misconceptions to be revealed and discussed. While tools with built-in engagement features are useful, however, not all applications are social or collaborative in nature. This does not mean that teachers shouldn't use them. They can look for ways to integrate co-use into an isolated technology application (Guernsey & Levine, 2015). For example, rather than having students read or listen to a book alone in a reading application such as RazKids or Epic, a teacher can ask students to find a reading or listening buddy and challenge the teams to discuss the review questions and get every single one correct the first time through. The teacher could also encourage each pair to read out loud to each other. ▪ Asking students to reflect on what they are doing with technology through visual thinking routines (such as turn and talks, see-think-wonders, or share-alouds). ▪ Conducting "switcheroos," where an individual student starts working on his device, then trades devices with the student next to him when the teacher calls "switcheroo." Students then either add to the content (such as a story or image) or provide feedback on it, and then switch back. While most technology use excites and motivates students, it doesn't always support cognitive growth around academic goals (Wartella, 2015). In fact, it has been found that most 3rd graders will get "off-task" after 10 minutes of an activity (Godwin et al., 2016). Students can quickly get distracted when using technology tools, and teachers should be careful not to assume that engagement in using a device or application is the same as engagement in the learning goal. Additionally, research has shown that just having a technology device next to a student can cause a decrease in a student's cognitive capacity to learn (Ward et al., 2017). When a laptop or smartphone is sitting on the desk unopened, students can be distracted by the "idea" of what they could be doing on the device or worried that they are missing a text message or email. Pedagogical strategies play a vital role in keeping students on task when using technology. Imagine a high school science teacher who wants his students to use the virtual reality tool Google Cardboard to investigate animals in their natural habitats. Instead of simply handing out the Google Cardboards and iPods and telling the students to find the habitat application, the teacher first gives them very explicit instructions for the project. He shows them how to find the application on the device, so the students can focus on getting to the right place and not click on random buttons. Then the teacher gives each student a checklist of animals to look for and questions to ask themselves when they find the animal. Next, the teacher hands the students the devices, and they do a quick tutorial together. Finally, the teacher allows the students a short amount of time (10 minutes or less) to complete the task on their own. After 10 minutes, the teacher asks students to pair up and reflect on the activity. The reflection activity lets the students know that there will be some personal responsibility for learning the content and sharing what they have learned. Administrators can also encourage teachers to look for technology applications that have minimal off-task distractions. Examples of apps with off-task distractions would be those that encourage students to spend time dressing up avatars, include too many "sticker" rewards for answering questions, provide distracting music or noises, or feature random hot spots to click on or swipe that are not related to the learning goal. One easy way to check for the amount of distractions in an application is for teachers to ask themselves, "Are my students talking more about the fun avatar that they get to dress up, the number of points they have, or the actual content?" ▪ Teach students how to self-monitor and self-reflect about what they are doing on their screens so that their minds are on the learning goal. Ask them periodic questions such as "Are you doing an activity on the device that helps to meet our learning goal today?" ▪ Help students write a "plan of action" in which they create a personal learning goal for their technology time. ▪ Monitor students' technology activity and periodically sit down with individual students to ask probing questions about what they are doing with the technology and why. Learning with technology is best when it supports higher-order thinking and skills (Hirsh-Pasek et al., 2015). When students are using technology to create, analyze, evaluate, gather, and synthesize knowledge, there can be long-term and positive cognitive growth. Teachers should look for technology tools that can help develop these types of cognitive skills. Many tools that ask students to use their creation or synthesis skills are not content-specific; rather, they are more general tools that allow students to create or produce something such as a podcast, video, book, or poster. Examples of these types of tools are Seesaw, Google Slides, Padlet, EdPuzzle, Flipgrid, and Book Creator. However, just using tools that encourage higher-level thinking is no guarantee that academic learning will occur. Teachers still need to purposefully design strategies to help connect the content learning to the creation software. For example, if a 6th grade science teacher asks students to create skits about different biomes in iMovie with little direction, the movies could quickly become blooper reels without real content learning (focusing instead on the fun editing tools or on being silly in the skit). However, the teacher could ask the students to use iMovie to put together a documentary about the biome they live in, specifying certain scientific criteria they must address. She can take this even further by partnering with other classrooms across the world that are in different biomes, so that students can share their videos with their peers in other countries and get exposure to different areas of the world, while sharing their own work with an authentic audience. When using content-specific technology applications, which often focus on lower-level cognitive skills, administrators can encourage teachers to add instructional strategies that help their students use higher cognitive skills with the software. For example, a 1st grade teacher whose students are using a drill-and-practice software to learn reading comprehension skills can ask her students to complete a reflective notebook entry on what they learned and how they can use those new comprehension skills in real life when reading for understanding or detail. When using formative assessment tools such as Quizizz or Kahoot!—which are fun but can quickly turn into races or games instead of an in-depth consideration of the learning content—a teacher might turn off the timers in the application, have students work in teams (with one device) to discuss and come up with a consensus response before answering, or review questions together as a class after the quiz is over. By integrating these moves, the teacher can help the students use higher-level thinking skills to discuss, argue, and analyze the content. To enhance learning with technology, educators should also consider valued-added learning over traditional resources. Administrators can encourage teachers to ask themselves, "What value is added to the learning experience by integrating this technology into the activity over a traditional method?" The value could be a more authentic learning experience or added scaffolds and supports that are harder to offer without the technology. For example, a world language teacher who has a learning goal of helping students understand the cultural similarities and differences between France and the United States might read the book A Walk in Paris by Salvatore Rubbino to her students. Then she can ask her students to log on to Google Earth and compare the streets, clothing, cars, and other artifacts they see in the images of Paris to those in images of their own community. This gives students a more authentic way to compare cultures than just looking at the illustrations in the book. ▪ Select software or technology tools that provide scaffolds or supports for students to more easily understand the learning goals. ▪ Create screencast video tutorials on how to use the software. By creating the screencast video (and not relying on the "stock" video tutorial that comes with the software), the teacher should be able to personalize these tutorials with hints, tips, and other scaffolds for differentiating instruction for the students. Learning happens when it is situated in authentic contexts (Brown, Collins, & Duguid, 1989). Technology should help bridge real-world learning with the classroom curriculum. For example, a teacher could use Skype to connect an expert scientist to the class when students are studying about a particular scientific phenomenon. Or a 10th grade social studies teacher could use the mobile tool GooseChase to create an interactive scavenger hunt that her students can complete on their phones while on a field trip to a local historical museum. As the students wander the museum and complete tasks, they will be collecting data, pictures, videos, and text-based reflections on artifacts in the museum. All of that data will be stored in the GooseChase website for future reference and analysis. This gives the museum experience more purpose while the students are there and extends the learning throughout the year. ▪ Discuss how the activity students are doing with a technology application could also be done in the real world. For example, instead of using Excel spreadsheets to create charts from artificial data, use real-world data (such as statistics from a recent baseball game), which creates a more authentic purpose for students' work. ▪ Use technology tools that students can also use in their everyday lives. This makes transfer of skills easier, especially for younger students. Technology, when not used effectively, can distract or disrupt a student. And yet increasingly, school leaders are faced with the pressures of incorporating flashy new tech tools, apps, and programs into the classroom. The Triple E framework can ease this pressure by providing a sound foundation to build engaging, enhanced, and extended learning through technology. The right questions and coaching from a school leader can ensure that students are learning through the tools provided to them—not in spite of them. › Are you currently integrating tools or apps into your classroom or school? Has reading about the Triple E Framework inspired you to do anything different? › How do you minimize student distraction when using technology? › Which of the Triple E Framework components do you think is most important? Why? Dewey, J. (1897). My pedagogic creed. The School Journal, 54(3), 77–80. Godwin, K. E., Almeda, M. V., Seltman, H., Kai, S., Skerbetz, M. D., Baker, R. S., et al. (2016). Off-task behavior in elementary school children. Learning and Instruction, 44, 128–143. Guernsey, L., & Levine, M. H. (2015). Tap click read: Growing readers in a world of screens. San Francisco, CA: Jossey-Bass. Ward, A. F., Duke, K., Gneezy, A., & Bos, M. W. (2017). Brain drain: The mere presence of one's own smartphone reduces available cognitive capacity. Journal of the Association for Consumer Research, 2(2), 140–154. Wartella, E. (2015). Educational apps: What we do and do not know. Psychological Science in the Public Interest, 16(1), 1–2. Liz Kolb is a clinical associate professor of education technologies at the University of Michigan School of Education. She is the author of many books, including Learning First, Technology Second (ISTE, 2017).